The Biology Department undertakes teaching and research in a wide range of biological disciplines. Recognized consistently as a Center of Excellence by the Commission of Higher Education (CHED), the Department has highly competent teachers committed to training students and producing quality research. It has well-equipped science and research laboratories which are located at the sixth floor of St. Joseph Building and at the second and fourth floors of the Science and Technology Research Center (STRC). Some of its areas of research are medical microbiology, bacterial genetics, molecular biology, cytogenetics, marine science, environmental science, and toxicology. The Department of Biology sees itself as a well-equipped and efficiently organized center for the biological science composed of a highly competent faculty in the areas of Organismic, Molecular, Environmental and Applied Biology. Original research and scholarly works in all fields are continuously published for the scientific community. Students who complete the various undergraduate and graduate programs are competent, active leaders and players in their respective fields of biological endeavor. The voice of the Department is heard and respected in societal issues dealing with Biology and the environment. In AY 1980-1981, the Department realigned its course offerings and course syllabi to conform to the shift from the semestral to the trimestral system of the University. In 1982, the College of Arts and Science was split, and the Departments of Biology, Chemistry, Physics and Math were placed under the then newly-established College of Science. This was done to allow “more sustained effort and attention at developing the science programs.” The MS Biology Program was offered by the Department in AY 1980-1981, while the PhD Biology with major in Ecology was offered in AY 1987-1988. In AY 1995-1996, in response to the identified need to shorten the training period of a physician while still providing quality education, the Department offered the BS Human Biology program in consortium with the DLSU College of Medicine at the Health Sciences Campus in Dasmarinas, Cavite. 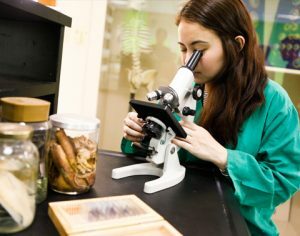 Through the years, the Biology Department has relentlessly endeavored to be abreast with the developments in the different areas of biology research and education to better improve and uphold the standards of its different undergraduate and graduate academic programs through the faculty, the teaching, research and service facilities and student quality. It has since been granted the highest Level IV accreditation by PAASCU, Level IV accreditation by the Federation of Accrediting Agencies of the Philippines, and recognized by CHED as Center of Excellence in Biology.